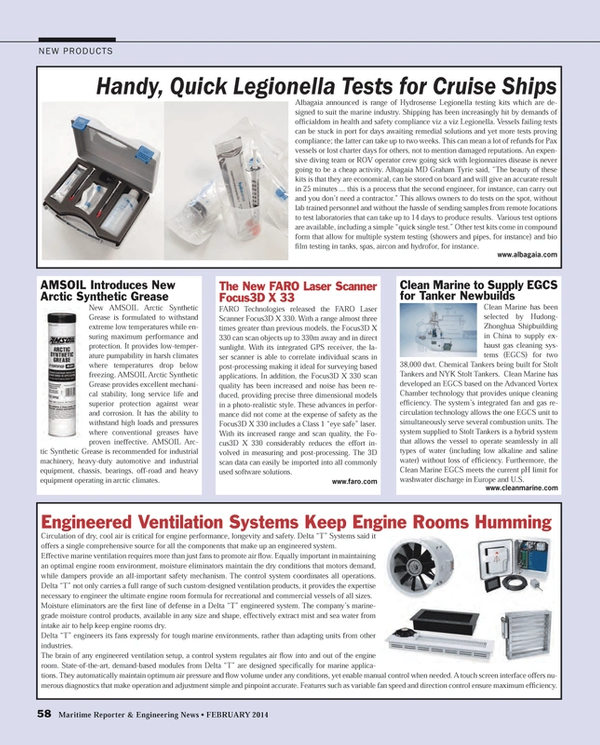 Albagaia announced is range of Hydrosense Legionella testing kits which are designed to suit the marine industry. Shipping has been increasingly hit by demands of officialdom in health and safety compliance viz a viz Legionella. Vessels failing tests can be stuck in port for days awaiting remedial solutions and yet more tests proving compliance; the latter can take up to two weeks. This can mean a lot of refunds for Pax vessels or lost charter days for others, not to mention damaged reputations. An expensive diving team or ROV operator crew going sick with legionnaires disease is never going to be a cheap activity. Albagaia MD Graham Tyrie said, “The beauty of these kits is that they are economical, can be stored on board and will give an accurate result in 25 minutes ... this is a process that the second engineer, for instance, can carry out and you don’t need a contractor.” This allows owners to do tests on the spot, without lab trained personnel and without the hassle of sending samples from remote locations to test laboratories that can take up to 14 days to produce results. Various test options are available, including a simple “quick single test.” Other test kits come in compound form that allow for multiple system testing (showers and pipes, for instance) and bio film testing in tanks, spas, aircon and hydrofor, for instance.